Offer valid until 3/3/2013! Get a free appetizer at Red Lobster when you purchase 2 Lobsterfest entrées. 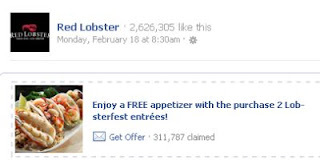 Click the link below to go "like" the Red Lobster on Facebook. Then click the link to get this offer. The offer will be sent to your email. Print it & take it to Red Lobster by tomorrow to get your free appetizer.